Background: Limb lengthening and reconstruction surgery (LLRS) is a relatively new orthopedic subspecialty. It started to develop in the 1980s when the Ilizarov method became known to the world orthopedic community. Purpose: We evaluated the caseload dynamics and compared the use of the Ilizarov techniques against the total of annual surgical interventions performed at our center. Materials and Methods: We retrospectively examined archival data on the admissions and surgical activities since the center's inception and in several years separately. The total of admissions, surgical activity, and the total of external fixation operations was calculated. We also reviewed all consecutive LLRS cases for a sample period of 2015, assessing admission patterns and surgical categories. Academic activity was reviewed using available databases of medical publications. Results: The total of admissions throughout 45 years was 185,839. The number of admissions reached 12,451 in 2016, almost six times more than in 1986. In 1996, the surgical volume significantly decreased and started to grow significantly from 2011. LLRS reduced relative to the total of operations performed though its absolute number grew by 52.6% in 2016 as compared with 1986. It comprised only 30% in 2016 while other orthopedic and joint pathology techniques were employed in 70% of operations. The number of operations with the Ilizarov method for osteomyelitis increased >4.45-fold in 2016 as compared to 1986. According to the Scopus database, the most productive years were 2015 and 2016 with 50 and 54 articles, respectively, published in the national and international journals. Conclusions: The scope of the center's activities has expanded beyond the Ilizarov method. Many newer technologies for the management of musculoskeletal diseases are employed to meet the needs of the market. Due to growth of musculoskeletal diseases and above mentioned factors, LLRS activity has been constantly growing. Its main concepts are the Ilizarov philosophy, age, and technical continuity. The subspecialty started its evolution in the former Soviet Union. It is associated with the name of Gavriil Ilizarov (1921−1992) and the staff of the Russian Ilizarov Scientific Center for Restorative Traumatology and Orthopedics in Kurgan that continued the activities of the Kurgan Research Institute for Experimental and Clinical Orthopedics and Traumatology founded in 1972. Nowadays, the center is been considered as one of the largest and unique orthopedic centers in the world dedicated to the LLRS practices, research, and training. We retrospectively examined the archival data on the activities of our center, studied the referrals and LLRS's performed in 1986, 1996, 2006, and 2016 to evaluate the dynamics in the use of the Ilizarov techniques, their volume, and reflection in academic publications. Our orthopedic center comprises of 21 orthopedic departments, of which 14 are mainly dealing with the Ilizarov external fixation used for LLRS. There are two orthopedic trauma services, two limb lengthening and deformity correction departments, a foot and ankle department, a hand and upper extremity department, two major joint disorder services for adults and children, a limb lengthening and prosthetic application unit, two bone defects, and three bone infection departments. Our hospital also has a rehabilitation department that specializes in postoperative recovery of joints and general physical activity of the patients treated with the Ilizarov method. We retrospectively reviewed archival data on admissions and surgical activities of the center since its foundation. The total of admissions and surgical activities from 1971 to 2016 were calculated. The annual surgical activity was measured as a ratio of the total of patients operated to the total of the patients admitted. The Ilizarov surgeries applied at our orthopedic departments in 1986, 1996, 2006, and 2016 were compared to see the historic dynamics in their use and measure their proportion of the total surgical volume in these time periods. We also reviewed all consecutive LLRS cases for a sample period of 2015, assessing admission patterns within our medical center and surgical categories. Academic activity in the periods under this survey was reviewed using the PubMed database (USA national library of medicine) and Scopus database (Elsevier, Holland). Since the foundation of the center 45 years ago, the total patient admissions needing surgery were 185,839. [Figure 1] shows that the number of admissions was growing steadily and reached 12,451 patients in 2016, almost 6 times more than in 1986. Surgical activity dynamics is shown in [Figure 2] and measures the ratio of the number of operations performed each year to the total of admissions. 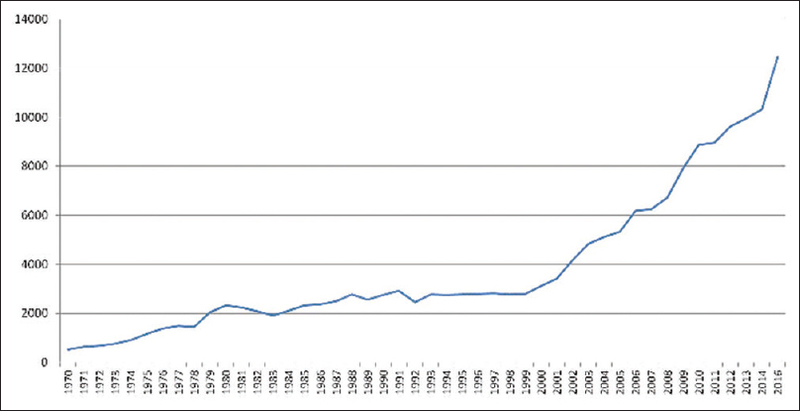 After the foundation of the center, the LLRS activity was the highest in 1974 and remained rather high till 1992. This is the period when only the Ilizarov method was used at our institution. It coincides with the work of G. A. Ilizarov and ends with the start of historical changes in the country toward the market economy in the 1990s. 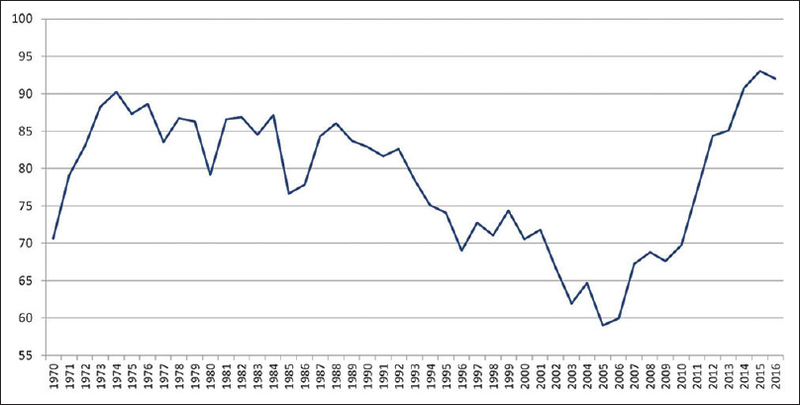 Surgical activity significantly decreased in 2003 and started growing again from 2011 [Table 1]. [Table 2] presents the LLRS activities in the time periods studied separately and demonstrates that the proportion of LLRS declined relative to the total of operations performed though its absolute number grew by 52.6% in 2016 compared with 1986. In the recent years, LLRS accounts for only 30% whereas other orthopedic and joint pathology techniques are used in 70%. 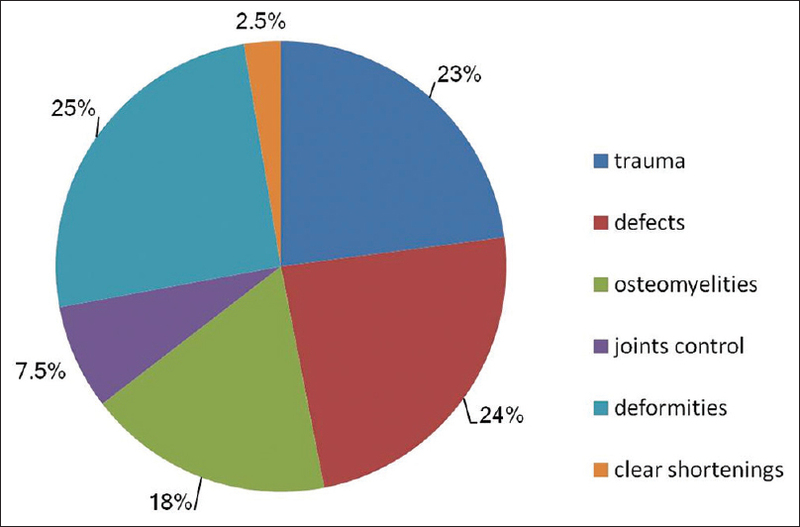 Orthopedic categories treated with LLRS are shown for year 2015 [Figure 3]. Bone Injuries, defects, and deformities constitute 72% of the surgical volume with external fixation. Osteomyelitis is the fourth category in the number of LLRS cases treated in 2015 [Figure 3]. 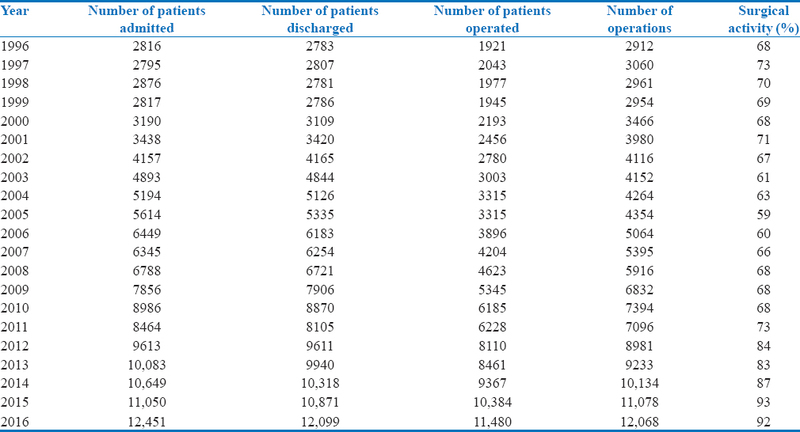 The Infected Nonunion and osteomyelitis department was enlarged in 2011 to deal with periprosthetic joint infection and spinal and posttraumatic osteomyelitis [Table 3]. More than half of the patients treated for osteomyelitis suffered periprosthetic joint infection. The number of operations to arrest osteomyelitis with the Ilizarov method increased >4.45-fold in 2016 as compared to 1986. Posttraumatic osteomyelitis makes almost 70% among these cases. Numbers of peer-reviewed articles published by center's staff members in the periods under review are given in [Table 4]. In the years 1986 and 2006, studies from the center's researchers were published only in the national journals. International Orthopedics and Strategies in Trauma and Limb Reconstruction were the journals in which most of the recent studies were published. The most cited articles were devoted to the use of the Ilizarov method and its modifications.,, According to Scopus database, the most productive years were 2015 and 2016 with 50 and 54 articles, respectively, published in the national and international journals. Our center provides patients access to a specialized LLRS service since the last 45 years. Since 1985, the hospital's capacity is over 800 beds. However, the main drawback of the Ilizarov method such as a long treatment period was recognized as the main factor influencing hospital expenditures due to a prolonged inpatient stay and made us search ways for its reduction using combined and modified fixation means. Moreover, the majority of patients arrive for treatment from distant places of Russia and cannot be treated as outpatients due to our country specifics and a lower quality of life. A number of congenital conditions such as big LLD amounts, phosphate diabetes, femoral deficiency, achondroplasia, and congenital tibial pseudarthrosis require a continuous treatment for several years [Figure 4], and age continuity in their staged treatment is another factor that should be considered as patients refer to our hospital several times until their limb reconstruction is over. On the other hand, musculoskeletal conditions have become the most frequent cause of physical disability in the aging population. The techniques of their management were acquired by our surgeons to widen our orthopedic surgical volume. Therefore, the admissions given in [Figure 1] reflect the total of admissions as far as the scope of the center's activities has expanded beyond the Ilizarov method since the introduction of neurosurgery and vertebrology department (1993), joint replacement units (2001), and joint arthroscopy service (2000). In the recent years, among the variety of orthopedic tools employed, the LLRS with the Ilizarov method makes only 30% while 70% of interventions are performed with other orthopedic and joint pathology techniques. Unfortunately, the rate and severity of septic complications following joint replacement, spinal surgery, and the incidence of posttraumatic infections have been increasing. The center has become a place where these complications may be successfully treated and opened its bone infection clinic in 2011 with a greater number of beds. Patients are admitted there from the entire Russia and former Soviet republics. Ilizarov method technical continuity, its modification, and combination with other methods are the basic principles of the present day LLRSs at our center. The Ilizarov method combination with intramedullary nailing, development of external fixation technique for multiple locations including pelvic fractures, hand microsurgery, and introduction of internal techniques for spinal deformities are nowadays the integral part of our activities [Figure 5]. Given the challenges of the competition at the medical market and new requirements set before medicine by the society and the Ministry of Health, a clear strategy of center's development was a great need. Therefore, a harmonious mix of the scientific, clinical, and educational potential was the basis for designing our strategy in 2010−2011. Its main concepts are the Ilizarov philosophy, aged treatment succession, technical continuity, and introduction of new surgical techniques for the sake of a faster recovery of our patients. Being the most active clinical institution in the use of external fixation, the center applies a great number of other technologies for the management of musculoskeletal diseases. Thereby, we do not see any contradiction as far as there is a great need in joint arthroplasty and arthroscopy. It also allows us to acquire reliable financial means and a greater flow of patients to survive in the conditions of the market economy. We studied the archive data of the center's anniversary years that are linked with its historic events. In 1986 and 2016, the first and the most recent international anniversary conferences on the Ilizarov techniques were held. The year 1996 is associated with the 25th anniversary of our institution but was one of the most difficult periods in the country's history when transition to the market economy had a negative impact on medical activities. Historically, the Ilizarov philosophy has expanded beyond the Ilizarov method with exclusive use of the Ilizarov apparatus. It has become apparent that the fixation apparatus used for LLRS is not as important as the principles involved. This is why so many external and internal devices have been developed in clinical practices that follow the principles of the Ilizarov compression and distraction osteosynthesis - the two main technical approaches used by LLRS. The center has also taken on a responsibility for orthopedic education., It holds training courses on LLRS, spinal disorders, and joint arthroplasty. Annual “Ilizarov readings” conferences bring together orthopedic surgeons who specialize in LLRS. Our academic activity also serves the goal of publishing new research developments in the LLRS use. Our study revealed that both LLRS activity and total surgical activity have been constantly growing at the center. The growth of patients' flow to receive a specialized medical treatment at a famous institution by the Ilizarov minded staff is the recognition of the efforts and skills of its surgeons. The 45-year-old history of our center confirms the Ilizarov method efficiency. The Ilizarov method development is possible only in harmony with scientific and educational programs. Ilizarov philosophy, age, and technological continuity are the key principles of a large LLRS center. If organized well, the expansion of orthopedic surgical directions may potentiate and add to the use of external fixation. Lowenberg DW, Green SA. Advances in limb lengthening and reconstruction: Editorial comment. Clin Orthop Relat Res 2008;466:2899-900. Goldstein RY, Jordan CJ, McLaurin TM, Grant A. The evolution of the ilizarov technique: Part 2: The principles of distraction osteosynthesis. Bull Hosp Jt Dis (2013) 2013;71:96-103. Hamdy RC, Bernstein MA, Fragomen AT, Rozbruch SR. Specialty update: What's new in limb lengthening and deformity correction. J Bone Joint Surg Am 2016;98:1408-15. Rozbruch SR, Rozbruch ES, Zonshayn S, Borst EW, Fragomen AT. What is the utility of a limb lengthening and reconstruction service in an academic department of orthopaedic surgery? Clin Orthop Relat Res 2015;473:3124-32. 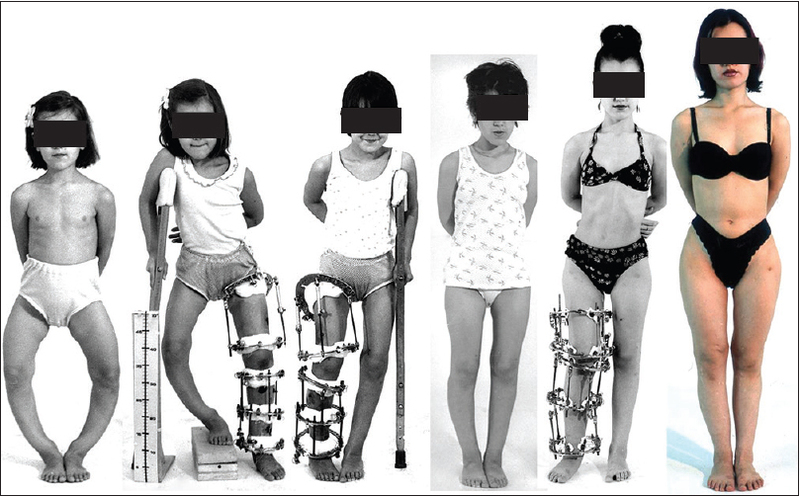 Popkov A, Aranovich A, Popkov D. Results of deformity correction in children with X-linked hereditary hypophosphatemic rickets by external fixation or combined technique. Int Orthop 2015;39:2423-31. Borzunov DY. Long bone reconstruction using multilevel lengthening of bone defect fragments. Int Orthop 2012;36:1695-700. Weinstein SL. The burden of musculoskeletal conditions. J Bone Joint Surg Am 2016;98:1331. Malizos KN. Global forum: The burden of bone and joint infections: A growing demand for more resources. J Bone Joint Surg Am 2017;99:e20. Poudel R, Kumar VS, Kumar A, Khan SA. Publication trend in the Indian Journal of Orthopaedics: What is published and why? Indian J Orthop 2015;49:661-4. Dorman SL, Graham SM, Paniker J, Phalira S, Harrison WJ. Establishing a children's orthopaedic hospital for Malawi: A review after 10 years. Malawi Med J 2014;26:119-23. Popkov AV, Gorbach EN, Kononovich NA, Popkov DA, Tverdokhlebov SI, Shesterikov EV, et al. Bioactivity and osteointegration of hydroxyapatite-coated stainless steel and titanium wires used for intramedullary osteosynthesis. Strategies Trauma Limb Reconstr 2017;12:107-13.